There a few things that will help you understand the terminology of doors before you order! WHAT DO THEY MEAN BY "WHAT HAND IS THE DOOR?" Door 'handing' is the way to describe how a door swings open. This is an important detail to know when you order a door. There are a few different ways to determine how your door swings. Put your back to the hinges while the door is open. If the door is on your left side, it is a left hand door. If it is on your right, it is a right handed door. When you push open the door, what side is the door on? If it is on the right, it is a right hand door, if on the left, it's a left hand door. WHAT IS A "DOOR SWING?" 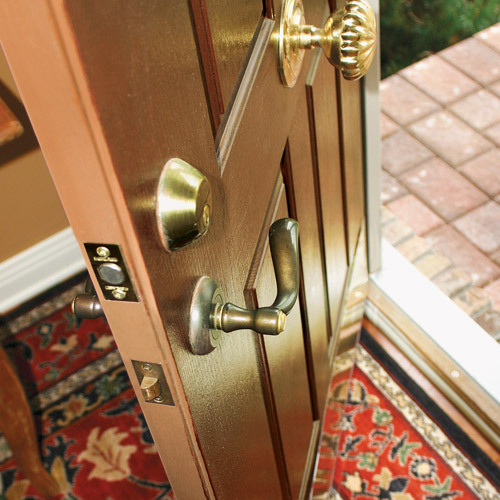 Inswing vs. Outswing This is a very simple one, and it applies only to exterior doors (i.e., doors that are for entering or exiting your home). If the door opens into the house, then it's an "inswing" door. This is the standard way a door is installed. If the door swings outside, then the door is an "outswing" door. Handing is still determined the same way, but you must specify that the door is an outswinging door to get what you want! WHAT SIZE DOOR DO I NEED? The size of the door you need depends somewhat heavily upon the manufacturer's specifications, as well as the situation you are working with. If you are adding a door, then you need to figure out what size your rough opening is. If you are replacing a door, then measuring the door itself is the best way to determine what size you need. There are a few common sizes for heights and widths of doors. These sizes have been in use for decades now. For older homes, and by older I mean homes that were built more than 50 years ago, these sizes may not work perfectly, which leaves you with a search for a custom door. The most common door heights are 6' 6" ( 78" ) and 6' 8" ( 80" ).The most common door widths run along 2" increments. The most popluar of these are 2'6", 2'8", and 3'0". It is not unheard of to have doors ranging from 1' wide up to 3' wide. If the opening is any wider than that you will probably see double doors of some sort. There are companies that can make custome sized doors to fit odd-sized openings. This is not generally the most cost-effective option, though there are cases where it is the only option. If this is the route you wish to, or must take, then be sure to allow time for the door to be made - in some cases this can mean 8 weeks or more. The length of the boards is generally exactly what you order, though we usually only stock pieces of even lengths. The usual lengths are 8', 10', 12', 14', and 16'. In some of the larger timbers, like the 2x8's, 2x10's, and 2x12's, we also stock longer lengths (some up to 24'), since these are often used as rafters or for floor joists, where longer is usually better. A rough opening is the size of the hole that has been framed in.When a house or a wall is being built, it is easiest to allow for openings for doors and windows while the wall is still being built. This is for the obvious reason that it's easier to measure and cut something while it's lying on the ground, than when it's standing upright. The peices that make up the opening can be cut at stationary tools, and so be more accurately cut. The rough opening is usually a small bit larger than the size of the actual unit. This is to allow for last minute aligning of the doors or windows, so that they can be installed squarely. It makes more sense to get the walls in place first, and to do the picky work later, so that all of the detail work may be completed consistently. The size of the jamb of your door is one of the more important things you need to know. If the jamb you have is too large, it will have to be trimmed to fit the wall. If it is too small, then the framing lumber will be exposed, making a rather unattractive looking doorway. With exterior doors, the size of the jamb is especially important. If the jamb is not properly sized, there is a good chance that it will not open fully, or will be lacking in strength or draft protection. In most cases, your door will be going into either a 2x4 wall or a 2x6 wall. In either case, most door manufacturers make a jamb that will fit into that wall, after it has been sheetrocked, without any problem. By and large, if the door is on an interior wall, you will most likely have walls that are made of 2x4's. There are a few applications where there might be a thicker wall made of 2x6's, or a thinner wall made of 2x3's, but they are rare. Exterior doors can be a little trickier. Some homes were made using 2x4 construction, and so should have the standard jamb. Some homes are built with thicker walls, made of 2x6's. A quick trip with a tape measure should give you a good idea of which size wall you have. If it is closer to 4 1/2" than to 6 1/2" thick, then you have a 2x4 wall. When you order a jamb, there are certain regular sizes available. These sizes are made to accommodate the framing lumber, along with the correct thicknesses of 1/2" wallboard and plaster (where applicable). This is why doors are ordered with a 4 9/16" or a 6 9/16" jamb. There are other sizes, of course, as there are a few other sorts of walls. A drywall jamb is often 5 1/4" thick, and there are also even larger jambs to accommodate walls that are made of 2x8's. These, as well as custom sizes are available by special order. What if my home is older?There are still plenty of homes that were built in the age of full sized lumber. These are the ones that are fun to fix-up. Just about everything will need to be custom fit, mainly because the manufacturers stick to where the greater demand is - modern dimensional lumber. The first question is: Do you want an interior or exterior door? This is an easy question. If the door will lead to the outside of your house, or needs to be weather-tight for any reason, then you want an exterior door. It is made with seals and gaskets around the door, so that cold air and the weather are kept out more effectively. Exterior doors are also generally thicker (about 1 3/4" thick), providing extra protection from the elements and unwanted visitors. If the door will only go between heated rooms, or into closets, or other spaces inside the house, then an interior door should be what you want. You could use exterior doors everywhere, but they tend to be more expensive, and they are not needed inside the home anyway. Interior doors are generally a little thinner, measuring on the average around 1 3/8" thick because they do not have to withstand the same stresses as an exterior door. Next you need to decide the style of the door. This will help to set the style and tone of your home. In traditional houses, 6 panel pine doors are the most common. More recently, hollow core doors have become more popular, thanks to their lower cost but similar styling. Modern styled homes might prefer a flush door or a different style door altogether. There are also options that can help to recreate an old-world style, with doors that have only two panels, a single panel, or other sorts of combinations. Of course, as you drift away from the more popular styles, the costs tend to rise. With these decisions made, you only need information like the kind of jamb, the jamb size, the swing of the door, and the size of the door. There are several different sorts of jambs made for doors today. Each one has its own strengths and benefits, as well as its own problems. The spilt jamb is one of the most common, and most popular styles of door jamb. The reason for this popularity is its relative ease of installation. The reason the jamb is called "split" is the the jamb is shipped in two peices that fit together. The two pieces are shaped much like giant "C"s. One half has the door already mounted to it, with the casing already attached to it. The other half of the jamb also has casing applied to it. Installation is relatively simple with these doors because most of the labor required centers around making sure the door is level and plumb in the wall. There are no hinges to mortise into the jamb or the door, and the jamb comes together rather easily. The reason for the split jamb is that the two halves come together to sandwich the wall, providing a nice, finished look very quickly. For more details on how to install split jamb prehung doors, check with the manufacturer's recommendations, or ask a salesman. This describes a particular sort of door jamb that is generally found with interior doors. It gets its name from the single groove, or rabbet that is milled all the way around the frame. The door then swings into these grooves. This way, the jamb itself is a solid piece of wood, and the jamb itself keeps the door from swinging too far and breaking the hinges. The flat jamb with a stop applied is perhaps the simplest sort of door jamb available. It is made of two pieces of wood, unlike the sinlgle rabbetted jamb or the double rabbetted jamb. This means that it is easier to find acceptable quality wood to make up the jamb, and so is less expensive. The name itself is a description of how the jamb is constructed. The "flat" refers to the flat stock that the door actually hangs on. It is very often just a piece of 3/4" pine stock that has been slightly milled, and mortissed to accept the hinges. The "stop" is a particular moulding, called a stop moulding surprisingly enough, and is used with doors and windows to help hide the joint of the operating panel, and to literally stop it from being pushed beyond the track where it it supposed to stay. The stop moulding for a door is very simple to understand, since it is applied to the flat stock to keep the door from swinging too far through the opening, and thereby putting excess stress on the hinges. The moulding stops you from pushing the door the wrong way and ripping it out of the jamb.